Let’s take a quick recap of this recipe title. Winter squash, caramelized onions, gorgonzola, and sage? I could stop writing now and you’d probably be convinced that this recipe is winner. All the flavors of fall…in a quiche. Sage isn’t an ingredient I use often, but boy am I ever glad that I planted it in my herb garden this year. It grew beautifully over the summer and with the cooler fronts rolling in, I’ve been using my fair share of it here lately. Probably because it pairs so perfectly with the sweet flavors of squash. What was a challenge in this recipe was phyllo dough. Until last weekend, I had never worked with phyllo dough. And that’s an interesting fact because baklava and spanikopita are probably two of my favorite foods ever. I think I steered clear because I knew phyllo dough and butter are usually combined to make that perfect, flaky pastry. And I do mean perfect. Phyllo dough masters the flaky-factor. This recipe ditched the butter and used olive oil instead. Just a note that it’s not the phyllo dough, but the added fat, that make the health and calorie-conscious weary of the pastry dough. For the not-so-patient cook, phyllo can be a challenge. It is papery thin, delicate, and can be a tricky to thaw correctly. But rest assured…if I can do it, you can do it. Lastly, the dough was filled with loads of caramelized onion, low-fat milk, eggs, sage, and crumbled Gorgonzola. An amazing, protein-filled, vegetarian breakfast…or brunch! Our vegetarian guests enjoyed this quiche, and obviously, so did we. Heat 1 tbsp oil over medium heat. Add the onions and saute until the onions are tender, about 10-15 minutes. Reduce the heat to just a bit below medium. Add 1/4 cup water, cover and cook until the onions turn a deep golden brown, about 50 minutes, stirring every 5-10 minutes. Preheat oven to 400 F. Place butternut squash on a baking sheet lined with foil. Season with salt and pepper and roast until tender, about 30-40 minutes. Set aside. Lower oven to 375 F.
Brush a sheet of phyllo pastry with the remaining olive oil and fit it into the bottom of a greased 9-inch springform pan with the ends hanging over the side of the pan and repeat with the remaining sheets, placing them on top. Mix the onions, pumpkin, eggs, milk, gorgonzola and sage. Pour into the crust. Bake until golden brown and set in the center, 25-45 minutes. Yield: 6 slices. Result: If you love onions and gorgonzola, this is your match-made quiche. The phyllo dough added a very light, but indulgent-tasting touch and made the dish look very chic and elegant. While it took a bit of time to caramelize the onions and roast the squash, the rest of the dish comes together quickly. Excellent quiche! Guest-approved, too! 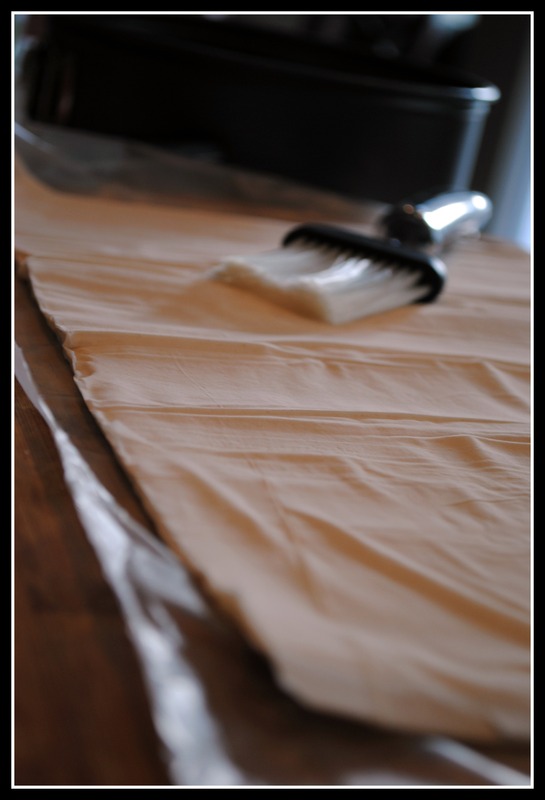 Question: Have you ever worked with phyllo dough? Wow! That looks and sounds amazing! The perfect combination of flavors. I’m so glad you know how to work with phyllo dough, because I may need your help come 11/11! I think I’m making a strudel with chicken and goat cheese (although I’m thinking of using blue cheese instead). HAve you ever seen whole wheat phyllo dough? The recipe calls for that and I thought you might know where (or if) I could find it. I have not seen the whole wheat…but I just bought it for the first time last weekend. I bet a bigger grocery store of Whole Foods would have it. I would assume MD has it…no? The meal sounds wonderful! I have seen SO many recipes bloggers do that require phyllo dough, but I’ve never bought it to use. Maybe because I still have a preference for things that require a thicker crust? However, this looks delicious! Aaaahhhhh gorgonzola…. 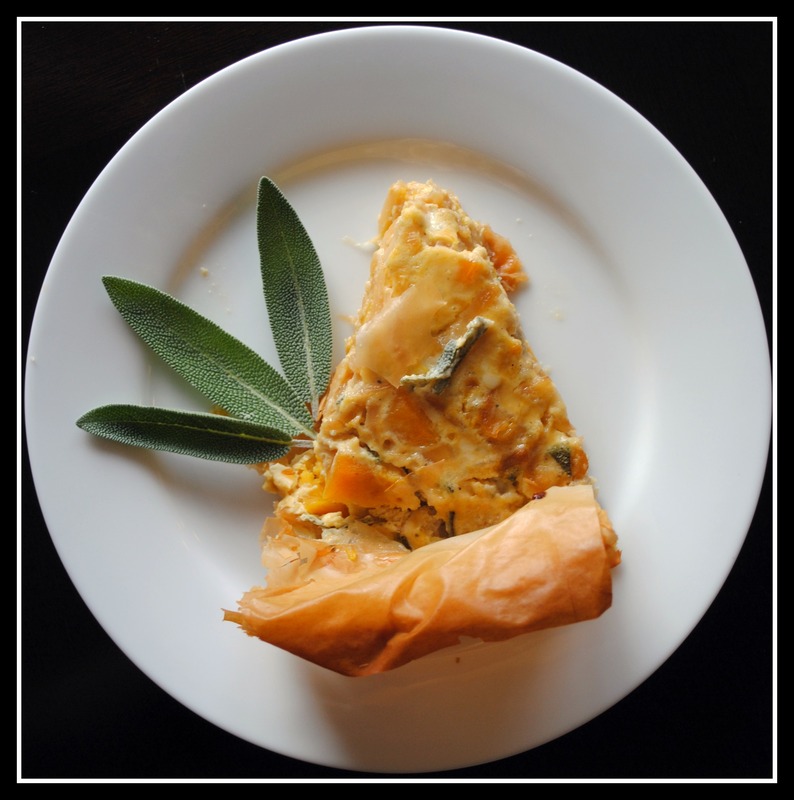 I’ve been searching for a quiche recipe – this is pefect!!! I’ve never worked with phyllo dough but I really should. I love how light and crunchy it is. Oh my now this sounds perfect. 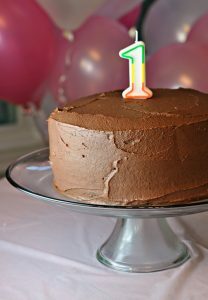 Will have to make this soon! Ooooh, this is beautiful!! Perfect for a holiday brunch! I’ve never worked with phyllo dough. 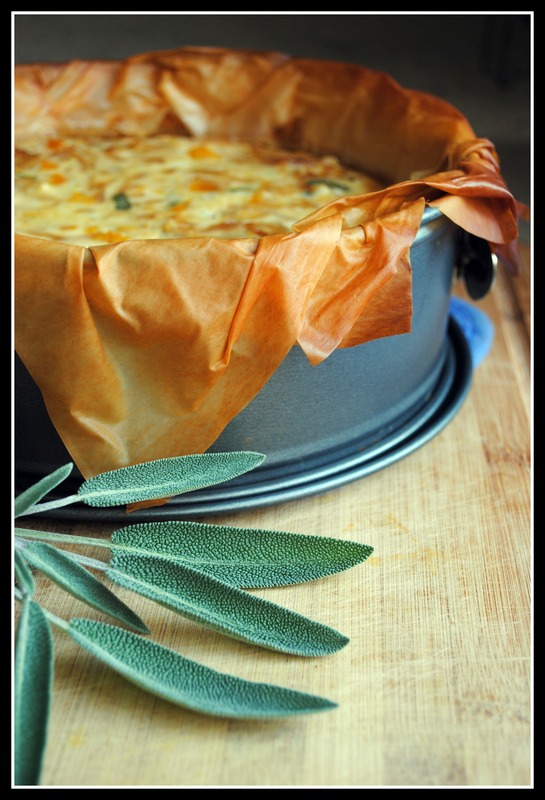 The recipe looks pretty yummy – I can almost smell it in the oven! This looks delicious…minus the gorgonzola. :o/ I just can’t get behind the moldy cheeses. What would you recommend as a substitute for the gorgonzola? Feta? Goat Cheese? I have never used phyllo dough! I think I should try it out though! Believe it or not, I’m not a fan of phyllo. Everything else looks great though. I wonder if I could turn it into some sort of crust-less quiche or something. Gotta love gorgonzola! I’m drooling just thinking about this quiche! It looks like the ultimate Autumn brunch! Please keep these squash recipes coming! I can’t wait to try them all. I am printing this off and making it. 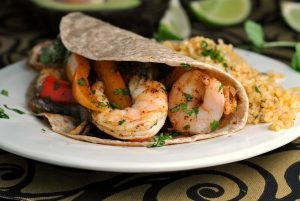 The only thing I am missing is the fresh sage or I would be making this in about 10 minutes! I just know it’s going to be amazing. Whole Foods does have whole wheat phyllo dough in the freezer. Thanks for sharing this. I would definitely make this. 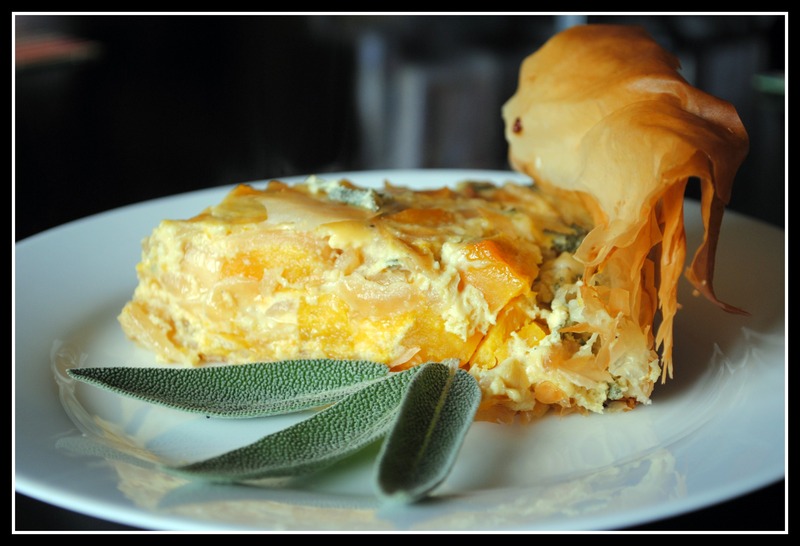 I love phyllo and embraced it as a good substitute for traditional pastry a while back. Tip for the onions… you can actually “caramelize” onions in the crock-pot. You just add a scant tablespoon of water + the sliced onions & let them cook all day. They do release some more water, which you’ll want to drain. They might not be “quite” as sugary caramelized, but they are definite a great substitute, especially in a recipe like this where they’re part of the dish, not the only taste. Kevin, Joanne, you… you all make this sound so good! Just FYI for your future phyllo endeavors, I’ve had good luck using cooking spray in between the layers. Not only does it save calories, but I really find it much simpler and less time-consuming. Give it a shot! 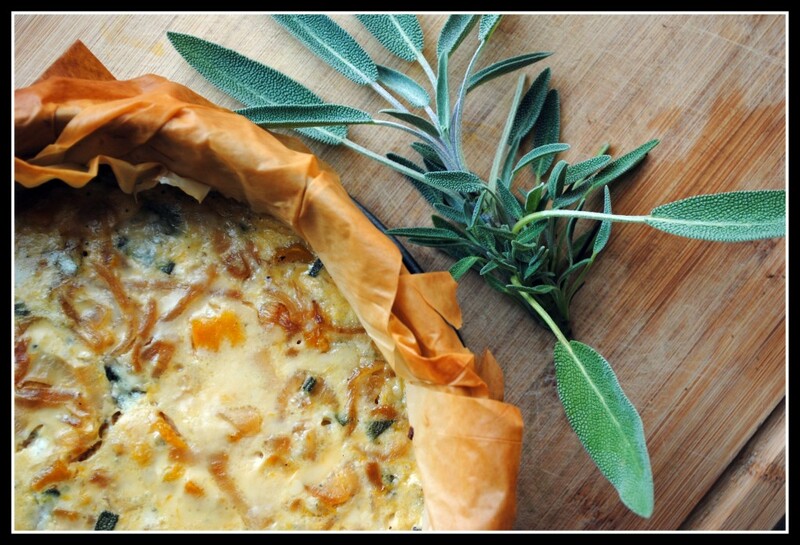 Megan: With most quiches I would say yes, but with the phyllo dough I just don’t think it would turn out. 🙁 I think you can assemble it all and bake at the last minute if that helps. Thus sounds and I can imagine this on my palate. Except for One thing I’m not a fan of Gorgonzola. Any suggestions? I think goat cheese or gruyere would be delicious!